With just your telescope and DSLR camera, you can capture some amazing views of our bright neighbor planets. You don’t even need a tracking mount! When I decided to get into astrophotography, Jupiter was at the top of my list of targets. Jupiter was very prominent in the sky all winter. Whenever the clouds cleared off enough to setup the telescope, Jupiter is almost always my first target, particularly with the camera. Now, with Jupiter setting to the west, we have Saturn taking it’s place from the east. Here are some tips to help you capture these brilliant gas giants. Probably the best method for doing planetary imaging is recording video of the planet through the telescope, then using a program like Registax to align and combine the best frames of the video into a static image. Celestron, Orion, and others sell specific planetary imaging cameras for this such as the Orion StarShoot 5 MP Solar System Color Camera. Frankly though, that’s a lot of work with specialized equipment and software. You can get really impressive results, but it takes an investment not only in equipment, but most importantly in time. Mind you, I’ll almost certainly find myself doing that process at some point, but for now, I prefer a more general purpose and simple approach. Jupiter and Saturn are bright planets – they have a visual magnitude between +1.5 to -3. What this means is you don’t need to take a long exposure to capture their detail. In fact, a long exposure will just wash out all the detail. This means you don’t need a computerized tracking mount. The exposures are short enough that you can point your telescope manually and get an acceptable image. For Jupiter, you only need an exposure of about 1/20th of a second to capture the cloud bands. If you want to capture the jovian moons, about a 1 second exposure should do the trick. Note that this longer exposure will get you the moons, but wash out the detail of the planet – I’ll talk about some relatively simple editing to deal with this in a minute. For now, just realize that you need two different exposures to capture both the planet and moons. Turning to Saturn, we have a slightly dimmer but equally magnificent target with the rings. Saturn is currently at opposition, which means the best and brightest viewing opportunities of the year. Even so, it is still a bit dimmer than Jupiter, which means a slightly longer exposure is called for. I found that about 1/5th of a second works well in my setup. Note that the camera settings listed are for my particular setup with a 6″ SCT and Canon T3i camera. If you are fortunate to have a larger aperture telescope, you will be able to take even shorter exposures and capture the detail. If you have a smaller aperture scope, you may need to extend the exposure times a bit. Focusing can often be a challenge with astrophotography. A camera with Live View makes this easier, particularly with the bright planets. Getting the planet centered and zooming in on the display, you can adjust the focus to where you see the most definition. In the case of Jupiter, look for clear cloud bands. For Saturn, look for well defined rings. If the moon is up, it also makes a great object for adjusting the focus. Air turbulence is a critical factor with planetary imaging in particular. If you have a camera with Live View that allows you to zoom in, you will be able to see the air turbulence and the distortion it causes on the image of the planet. The only real solution for this is clear, calm air. You will however notice that from moment to moment, the image may appear better or worse. One of the advantages of video imaging discussed earlier is that the software can filter out individual frames of video where the image is particularly distorted due to the air turbulence. When you are doing single exposure planetary imaging, you want to wait for the clear air breaks, and snap off your images during those moments. I’ve been constantly surprised at the little things I’ve learned quite by chance. In this case, it’s just how cool using a DSLR can be not just for imaging, but for observing Jupiter and Saturn without squinting through an eyepiece.This doesn’t work for dim objects, but I find it extremely enjoyable for planetary and lunar observing. You may be perfectly happy with a few good shots straight off the camera. If you want to go a little bit further with it, you can take a few of the best images and do a little sharpening and combining in Photoshop or a similar layered image editor. Running a basic sharpening filter on each layer can also help you achieve a cleaner image. Basic layer stacking is also a way to get a combined image of Jupiter and the Jovian moons by taking the shorter exposure images of Jupiter and the longer exposures with the moons and combining them. You can repeat the above stacking method twice, once for the longer exposures with the moons, and a second time with the shorter exposures of Jupiter showing the cloud bands. Once you have these two stacks, you can overlay the stack with the details of Jupiter into the image with the moons. Not sure what other gear or adapters you need? Have a look at My Astrophotography Gear. 108 Responses to "How To Photograph The Gas Giants: Jupiter and Saturn"
i have a canon rebel T6. do you know if my camera is capable of photographing jupiter? Yes Audrey. I have a T6i. You will need a minimum of about 600mm Focal length lens and if you want to get Jupiter with its moons, you’ll have to over expose the shot with an exposure of about 2 to 3 seconds. If you want to get detail of the planet, the best thing to do is to activate the Live View feature of the camera and adjust the ISO and exposure settings until you can see the good detail. An even better approach is to take a video of the planet and stack the frames of the video using a program such as Registax. I have a small book out available on Amazon called “Catching the Night Sky” with some basic info on Astrophotography. What is the easiest method to use to learn stacking. Emphasis easiest. Hi Elaine. I’m very new to astrophotography too. I have found the following book called “Astrophotography with Mark Thompson” ISBN 978-1-84907-314-1 very helpful. It is a little old but well written and has a good section on imaging/stacking for jupiter using free software. Not sure how to upload pictures i’ve taken but pleased how they have appeared for a beginner. Hello everyone, i would like you to help me, i have a Canon T3 and i’ve tried to take a video in live view to record Jupiter, the problem is when the time exposure, i’ve moved the time exposure in the mode video but i can’t get Jupiter look less brighter, Can someone help me to fix this problem or get less ISO? Hell Hugo. I have a T3 also. I don’t think you can adjust the ISO in video mode directly from the camera. 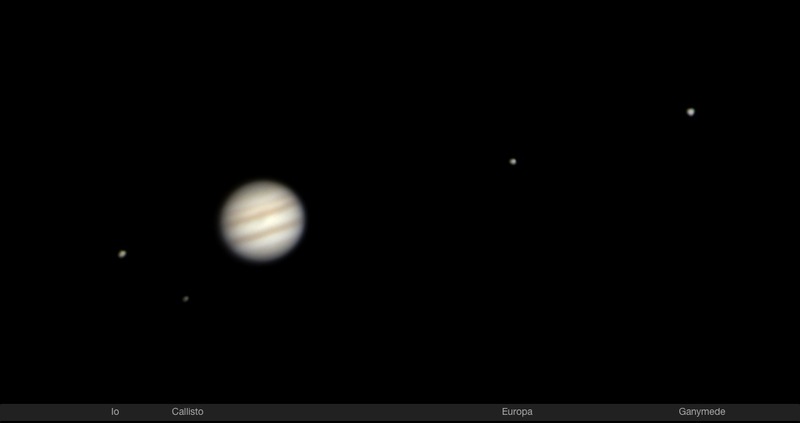 I use software that allows me to do that and also take Jupiter at 5x the size. See my comment to Mark yesterday. It’s EOS camera movie record. Not sure where I got it. Good info .thanx .but what prog u using for iso? How do that 5x bigger?.i tried prime focus with t1i through telescope celestron 130slt. And lense 50-250mm always blur.cant sharp with lense or telescope focuser 🙁 any help? I use ‘EOS Camera Movie Record’ utility. Not sure where I got it. it may have been on the CD that came with the camera or downloaded on line. Not sure. The 5x is a feature of the software a button that you click and it magnifies the recording. You can also adjust the ISO setting of the recording with this software. It will always be blurry if you do it at 5x, but that’s why you record to stack the video in a program like Registax. Use maybe a 24mm eyepiece projection and the 5x feature in the software, stack the video and you should get a fairly good shot. Frank do you have any images you can share that you took this way? Yes, but I don’t know how to post them here. Great info thanks! I have a question as I’m recently getting into astrophotography. I have a Celestron Nextstar 130 SLT and a Canon t3i. I have the t-ring and adapter and use a 2x barlow lens and I can get some great shots of the moon. The problem I’m having is that I’m actually too close so I can only get 1/2-3/4 of the moon rather than the whole moon. I tried to remove the barlow lens but then can’t get anything into focus. I’ve even tried to extend the length using parts of lens to see if I needed that extra length to focus in but nothing seems to work. Any suggestions? Also a second question is can you actually use magnification lenses along with the Barlow or does it have to be just the camera and the scope with the barlow only in between? Orion sells an extender. that increases the distance from the t-ring into the barlow. Its about 3 inches. I had the same problem with my Dob and it worked nicely. Greg, if it’s that large, you may need a focal reducer. But I have always been able to get the whole moon in with the camera directly onto the scope (prime focus). Using an extension will magnify the image. Greg, I think the problem of not being able to focus the camera without the barlow is because many Newtonian telescopes that are designed for visual use don’t have enough back-focus (the focus point is too close to the telescope tub to reach the sensor on the camera with the regular t-adapter). The reason it works with the Barlow attached is that changes the focus point, moving it outward. So, the problem isn’t extending the camera further away from the focuser, it’s getting the camera closer. I don’t think there are reducers or other adaptors that would help with this; you would need to replace the focuser with one that doesn’t stick out as far from the telescope tube in order to get the sensor on the camera in to the point of focus. This is a common limitation on Newtonians because they are designed to be used without a 90° diagonal like an SCT or Refractor. The use of the diagonal means the focal point is further back on those scopes, allowing plenty of back-focus for connecting a DSLR camera. With the Newtonian scopes, the focal point is much closer to the tube, and usually there isn’t enough inward focus for a DSLR camera connected with a t-adapter (Prime focus) to achieve focus – instead the focal point will be just in front of the sensor. The Barlow lets you get around this, but I’m afraid you’re stuck with using the barlow and doing a mosaic to get a full moon with that setup. What if I replace the Barlow with just an extender so it’s not doing the 2x magnification? Logically wouldn’t that work as it would still move the focal point out but without the magnification? I’ve never tried it; from what I understand reading about the extenders, they are intended for use with an eyepiece for eyepiece projection. That would probably work, depending on the eyepiece for your field of view. I am by no mean an expert as I am just staring out in astrophotography. Wow impressive photo. Yeah I guess for my moon shots that’s my best bet for now. To be honest with you, when I bought the telescope, astrophotography never even came to my mind but once I started seeing how beautiful all of these objects are, it peaked my interest. Great advice Sanjeev thanks. Is replacing a focuser something that is easy or is it manual adjustments to the scope? Thanks friend…i think replacing the focuser is easy but that costs more as good focuser will easily be around 150$…if u know somebody who is into making reflector telescope that would be a great help to you as he can easily push the mirror around 3 inch into the tube with great precision but you can also do that as all it needs a little bit of technical sound mind…Just be careful while cutting the tube with hexa blade it should be uniformly measured. Just a follow up – I ordered the Celestron 93230 8 to 24mm 1.25 Zoom Eyepiece which, when pulling off the eye rubber piece, threaded into my Canon with the t-ring and adapter and that actually allowed me to capture the full moon in one image. I also was pretty successful taking pictures encompassing the whole moon with just my t3i and my 55-250 lens using digital 10x zoom to focus and then just cropping out the moon so that the pic closes in on the moon at high resolution. Glad you got some good pictures! If you post them elsewhere (flickr, etc) feel free to add a link in a comment! If you are interested in posting your photos, there are lots of great forums out there. I’m a member of Amateur Astronomy – Telescope, Binocular and Imaging Forum on Facebook. Its a group of about 1500 people at all levels and the advice you get there is first rate if ou have questions. My sister took pictures of Saturn last night. Canon 5 with opteka 650-1300mm lens. Through the camera screen the pictures looked pretty damn good. However, she said when she uploaded them to her computer it just looked like a white dot. Does she need Photo$hop or a stacking image program? And programs such as deepskystacker…are they simple to use? The image preview on the camera will often be under-exposed relative to the actual photo that gets taken. It’s only an estimate, and it isn’t very accurate for things like planets and stars. It may be that she can edit the image to reduce the exposure and get some of the color back just by a brightness reduction. Any photo editor should work for that, no need for Photoshop. If the image is captured in raw format (.CR2 file) then she can actually reduce the exposure in photoshop camera raw or the canon editor software. Wondering if I am seeing stars? Took some photos using a Nikon at 50x zoom, and can see three, sometimes 4 bright spots next to Jupiter. Can a $250 camera actually achieve this, or are these just artifacts such as reflections in the lens? With a 50x zoom, you are probably seeing jupiter’s moons. Wow! I have posted the image on my Facebook page, I am truly amazed that I can capture moons that far away. I have always taken photos of the moon with this camera and never for a moment considered trying planets! Thanks for the advice. You are probably seeing Jupiter’s 4 most largest and visible moons. Sometimes it shows less moon when there is an occultation. Hello my name is Hugo and can i use my camera canon T3 for planetary imaging?!?! i read i can’t use liveview mode what can i do?! it’s still useful?! Hello Hugo. I have a T3 also. Yes you can use it for planetary. It also does have Live View. I take video of the moon and plantes, then stack them with Registax and do some processing in photoshop. Hello Frank, hope you are having a nice day!! And thanks for the reply, i’m new on this one! But i have to take pictures or in what mode do i have to put my camera M?!?! Yes, you want to use ‘M’ (Manual) mode. Change the exposure duration with the click wheel by the shutter button. About 1 second is a good place to start. Also set the ISO to between 400-1600. The ‘best settings’ depend on your lens, whether you have a tracking mount, the ISO setting, and what you re going for in terms of the picture. Hello Sorin! Thanks for your reply! i’m attaching my camera to my telescope Nexstar 6se to take photos of Saturn, but my camera T3 doesn’t allow me to take video! What else can i do?! If you have a canon T3(1100d) it does have video. It is the last selection on the mode dial. You should be able to do video, though there are no manual controls for it with the T3 – you pretty much get what you get. (refer to the T3 Manual, page 139). If Video gives you trouble, shoot stills instead. You can always do a series of still images and stack them in Registax or other software as well. (You can also try knocking down the resolution for stills and just take a whole series of short exposures as jpegs for stacking.) Set the camera to Manual mode for that. Focus will be with the telescope of course. Since you have a 6″ SCT (the same as I use with a T3i) your settings should be similar to what is in the article. If you have an intervalometer, it’s very helpful to use so you avoid shaking the camera when taking a photo. Well thanks Sorin and Frank, i will apply all the comments you told me, i want to thank you for taking the time to write me back! when i get a cool picture of saturn, i will share it with you!! Have a great day! You’ll have to experiment a bit, but at ISO 1600, less than a second should show you Jupiter’s moons, probably 1/20 – 1/40th or thereabouts for capturing cloud bands. Will depend how dark the sky is too. You may want something even shorter to get Venus without too much light bloom. Tuesday evening Venus and Jupiter will be only 20′ (1/3°) apart, so you won’t need the focal reducer, and could even add a barlow. (I’m hoping to photograph the pair Tuesday night with my 6″ f/9 RC scope and 7DII, which is a smaller sensor than your 5D3.) Good luck! I found this article very informative and good for my learning. I have nexstar 6se (without motor) on Alt-AZ mount and 600D. I tried connecting dslr using T-Ring and 2X barllow 2-3 times, but all I see is black screen. I tried adjusting my OTA mount a couple of times and felt frustrated. As of now, I am directly taking few shots / videos using 10X zoom on 600d using 18-135mm lens (f4 usually). I also have a question around meade broadband filter usage if you can help me with. For night time photography, you want to make sure the camera is set to a long exposure (several seconds) when you are getting setup. If the exposure setting is too short, you won’t be able to see anything on the screen. You also want to ensure the ISO setting is at least 800 or higher. Getting into focus can be a problem, and considerably different between with and without a barlow. I’d suggest trying it without the barlow first, make sure you can achieve focus, then try with the barlow. You can also set this up during the day, just point at something at least a few blocks away (not the sun!) to figured out how to dial in the focus. Hi Sorin, Thanks a lot. I am about to receive my new telescope – evolution 8 in couple of days, so will try this out. I had the same problem as you when I first tried prime focusing. What I did was aim my Orion 130ST at the moon, attached the Canon T3i and from there I was able to see my focus and adjust it accordingly. After you focus on the moon, you should be able to do see stars in live view. Use the live view magnifying button to achieve perfect focus on bright stars. With the moon, ISO100 or 200 will be fine but use 800 or more for stars and planets. I love this community of sky watchers. So helpful and supportive. Astrophotography is pretty difficult to do well. Good luck and show the results. It looks like it gives me a few connecting options. Directly to the eyepiece holder with an eyepiece, to the holder without an eyepiece, and directly to the optical tube. I’ll see how it works. Thank you for sharing your knowledge and images you’ve captured! I’m on my way out to get some shots of Jupiter with my Canon T3i paired to my Orion 70mm Equatorial Refractor Telescope. I’m in a city surrounded by light pollution however Im hoping to get a decent image of Jupiter and it’s satellites. Keep up the the great work! Eyepiece projection photography is difficult and often frustrating. The better option is prime focus, where you have an adaptor that directly connects the camera to the telescope with no eyepiece. I’m very new to astronomy and I’m still struggling in how to take photos of the planets and stars. For months I’ve been searching for answers on how to start and I have to tell you that I’ve found more answers on this article/comments than I’ve found on the past six months googling. I’d like to ask your advice on what accessories you are using to connect the camera to your telescope. I have a 8″ SC Meade telescope and I’ve been using my point and shoot camera right on the eyepiece. I actually managed to get quite descent photos from Jupiter the past couple days. They just look small and it’s very hard to hold the camera steady at the right spot. I plan to buy a camera to hook up to the telescope but I only find people using CCD cameras. I’d rather buy a DSLR since I could use for other things on a daily basis. I see people connect the DSLR straight to the scope bypassing the eyepiece holder, some connect it to the eyepiece holder without an eyepiece and some connect over an eyepiece. My question is: Which method are you using? and What parts would I need to buy if I were to buy a DSLR camera? Your answer is greatly appreciated! The simplest way to start with a DSLR is with a 1.25″ t-adaptor and a t-ring for your camera model. The t-adaptor slots into the telescope inplace of the diagonal and eyepiece, and connects to the camera body directly with the t-ring (replacing the lens on the camera). There are also adaptors that allow connecting the t-ring directly to the back of the optical tube, replacing the whole eyepiece assembly. The one advantage of the t-adaptor method is you can also include a barlow lens (essentially a doubler) to get a larger view on the camera. This is all called Prime Focus astrophotography. The other primary method you’ve already experimented with is called Eyepiece Projection, and while I’ve seen some good images of the moon and bright planets this way, I’ve always found it to be very limited. With a fixed lens camera though (as opposed to a DSLR) it’s your best option for imaging through the telescope. The 3rd option to consider is a Piggyback Astrophotography. This is where you mount the camera on top of the telescope, and use the telescope for tracking, but use the lens on the camera to capture the images. This can be an excellent way to start out in long exposure astrophotography for constellations and larger nebula and objects like the Andromeda galaxy. I also recently captured an image of Comet Lovejoy and the Pleiades cluster using this method with a 50mm lens. I have a 8″ Meade SCT also. I have a canon T3 camera I use connected to my lap Top. There are several software programs that will run the camera and give you live view. I take video of Jupiter and the moon, then process the video through a free program called Registax. It stacks all the video frames for reduced noise and sharpens detail. Then further processing through photo shop. The video program I use to control the camera is “EOS camera movie record” also Astrophotography tool APT. I have a recent picture of Jupiter and one of its moons on. my facebook page. Feel free to take a look. Search by name Frank Masciulli….. Clear skies everyone. Thank you Frank! I’m on the process of buying the camera and the adapter and then I’m sure I’ll need to process the images. Greetings, I’m an amateur too and just wanted to give my two cents for whatever its worth. I too use a t ring adapter of sorts, however me being the cheapskate that I am had made my own custom version using a combination of 2″ abs plumbing pipe and couplings. I attach it to my scope using a 1.25 to 2″ telescope adapter I got on ebay with a hole drilled in the side of the coupling in which to hold via the adapter’s screw. I have a plumbing fitting shoved snugly in the adapter to hold any eyepieces I want I think it is a valve meant to hold hoses though I’m not a plumber, then I have a 2″ pipe cut in length to the eyepiece/barlow combination I always use to photograph with, on the other end of the pipe is another 2″ coupling with the camera cap (normally meant to protect the cameras innards whatever it is called) glued in place and a hole drilled out of its center so I can see into the eyepiece to this I secure the camera. It works great and only cost about 15$ by the time I bought the plumbing fittings, replacement camera cap and 1.25 to 2″ telescope adapter off of eBay. I’m glad I did it that way especially since I saw t rings on sale for 20$ on a couple of sites and that doesn’t include any other parts. It’s great too as, if I decide later I want to photograph with different eyepieces I’ll just go cut another pipe length to size. Where I fail is in the camera settings, though I’m learning a lot from this site thanks to you all. What kind of camera And lents i will need to see The moon and planets ?,.. To see the moon, any point and shoot camera will do. For seeing any detail on Jupiter or the rings of Saturn, a focal length of about 500mm would be the minimum, and longer is better. Using a t-ring and t adapter, I was able to image the moon perfectly with the same Canon T3i you have and an Orion 130mm ST. However, I tried to use the video mode of the camera while attached to the telescope and got an error that no lens is attached. I wanted to video planetary images and process them to get a clear single image. How were you able to use the T3i video mode without the lens while attached to the scope? I had the same problem using my Canon EOS-M. I hunted through the manual and eventually found a custom function setting (C.fn) that allows the shutter to fire even without a lens attached. In my case that enabled both single shot and video capture. do you know anything about webcam imaging? i am starting out in astrophotography using a webcam, but having difficulty getting a picture with the detail ive been seeing from other photographers. i am using sharpcap and registax. im trying to get an image of jupiter. the image comes up on my laptop but not amazingly clear. you can make out the bands around the planet, but when i put it through registax, none of the detail comes out in the image. Wondering if you can offer any advice. You mentioned using video to capture multiple frames. Can I use the video capability of my Canon DSLR to capture several images? Yes, I have used the video mode on the camera before. The Canon T3 (but not the T3i) has a cropped video mode that will just use the central pixels on the sensor, which is ideal for planets. The Magic Lantern firmware for Canon cameras will enable this feature for most models, that’s something i haven’t tried yet, but I may look into it before the triple shadow transit. The trick then becomes processing those video frames. If you are on a PC, there is software like DSS to do that. On a Mac, I haven’t found software to do this easily. DSS is for deep sky objects as it needs stars to stack the images. Registax is a great stacking program for planetary videos, but your video must be converted to an AVI format to use. Frank, thanks for the correction! I recently installed Magic Lantern on my t3i. Aside from the hassle (and risk) of installing it, I gained nothing. The Canon t3i uses a memory card that cannot take advantage of shooting video in raw mode, because the card is too slow for the transfer of so many cr2 files in such a short amount of time. I get about 1/2 sec. of video. Disclaimer: I’m new to astro-imaging and have only used Magic Lantern during an afternoon of experimenting. Exactly what happened to me last night, I did capture the Jupiter’s moon at 1 sec of exposure but washed out the details of the planet itself. I wish I had read your article before, hopefully better perform in the next clear sky night ! Thanks Fahab for the kind words about the article. Best of luck with your next attempt! Thanks for the info Sorin, I’ll be trying saturn this weekend with my 12′ Dob… We shall see. First post didn’t seem to take…. I just tried photographing Jupiter tonight. I have a Meade 8in. SCT and a canon EOS 450D camera with a 2x Barlow into my right angle eyepiece holder. The image was on the LCD was so small, I could hardly focus it. Disappointed. How do you get the image so large? I see one in your picture above. Sorry, due to spam, I’ve had to moderate the comments. My camera has a 10x zoom feature in the live view mode, which is how the image is so large on the screen. I just tried tonight with my Meade 8in. SCT a canon EOS 450d camera and a 2x Barlow in my right angle eyepiece holder. The image on the LCD camera is so small, I can hardly see to focus it. Also I was not aligned good enough so the image kept moving even with the tracking motor on. Depressing. I would like to get as close as I can and have sharp detail, but I only have 200-500 dollars to spend. I don’t care if I have to maneuver it manually as long as camera fits and the images look good. I appreciate any help you give/share. For planets, a long focal length scope and a barlow lens are ideal. In the sub-$500 range, you will be a bit hard-pressed. If you can spend a bit more, I’d suggest an imaging newtonian. A 6″ size scope (the same aperture I use) runs about $300-$400, but that’s just for the telescope, not a mount. The trick with planets is you want a very long focal length – the equivalent of about a 2000mm-4000mm lens. It’s a bit of an investment. You can get started with something like the Orion Short Tube 80, which is cheap enough you can also buy a mount and the camera adaptor and barlow within your budget. This would be a great starter set if you aren’t ready to make a bigger investment. I have a skywatcher evo 90 and a nikon dslr. I can see jupiter brilliantly with my 2x barlow and both 25mm and 10mm lenses however when i prime focus my camera and set it to live view i dont pick up anything even with the barlow. Any idea why this is? I aquired an extention that allows me to put a lens inside the tube to then project onto my camera, this allows jupiter to show up on the moniter however its not as close as it is when i look through the actual eyepiece without the camera. It’s so frustrating as i just want to record what i’m seeing with my eyes! I would suggest trying to focus the DSLR setup during the day on a distant object (a tree or building) to make sure the camera will come to focus with the barlow. It may also be a case that the ISO or exposure duration is set too low. Adding the barlow means less light is getting to the camera, so you need to lengthen the exposure vs w/o the barlow. I’m guessing when you say the extension that allows a lens inside the tube, you mean eyepiece projection. One of the reasons jupiter will look smaller on the camera than at your eye is the sensor is much larger than your pupil, so in reality, the same amount of light will be hitting the sensor, but just a small part of the sensor. You will need to crop the images quite a bit to see the planet well. If your camera supports cropped video mode (where it just uses the central portion of the camera chip) this may give you a better view. Glad you found it helpful, and good luck with the DSLR! Hi there. I’m a beginner at astrophotography and I have a Rebel T2i. You mentioned a 1500mm lens – this is on the telescope, right? Hi Garrett, yes, the 1500mm refers to the focal length of my particular telescope. When connecting the DSLR directly to the telescope in place of an eye piece (called prime focus) then the telescope is effectively just being used as a telephoto lens on the camera. I just wanted to thank you for this simple to follow guide. I was just outside snapping some pictures with some frustrating results. After reading this I am going to go back out tonight! Thanks for the kind words. Clear skies! How do you get prime focus with a Barlow lenses? For prime focus I have connecting ring that attaches to my newtonian’s focusing tube in place of the eyepiece. I guess I could use my 1.25″ universal adapter and take the eyepiece out and slip that into the Barlow but I was wondering if you had another method. I do exactly what you stated, use a 1.25″ adaptor that screws onto the camera t-ring, which then slides into the Barlow. Hi, this is good, I am wondering though how you got such a good image on your camera lcd, I have a t3i as well, though not with a separated lcd screen. when I have Jupiter on it, it is too bright to see detail and I have tried multiple exposure settings on the camera to try to capture the cloud bands but have not bee successful as yet. I have tried 3200 iso, and long exposures to no avail. I will try 800 as you suggest and the speed you suggest adjusted for my 9.25 sct. will see what happens. Since Jupiter is so bright, you actually need a much shorter exposure. Particularly with a larger telescope like a 9.25 SCT, think exposure lengths of about 1/200th of a second @ ISO 800. If you have a barlow on there, maybe a slightly longer exposure, but probably no more than 1/60th of a second. You’ll need to experiment a bit to find what works best. If it’s still just washed out at 1/200th and the lower ISO, just keep going. It will get dimmer as you step down the exposure duration and/or ISO. You can always just take a big jump down to something like 1/2000th and just see what you get and work your way to the middle. Great article and very helpful. While I am saving up for a QHY CCD camera, it’s good to know I can get great shots with my DSLR and 6″ SCT !! Thanks for the comment, I’m glad you found this post helpful!